Want a KILLER murder mystery party? A murder mystery party is a fantastic way to have a fun night with friends, colleagues and family! Worried your guests will be bored, or won't mingle? What about your friends that don't know anyone? Murder mystery parties are so much fun your friends will be amazed! Our murder mystery games are exciting and unique and provide your guests with an experience unlike any they have had before. For a killer murder mystery party or night of mystery you have found the right place. We ship free of charge anywhere in the UK, USA, Canada, NZ or Australia or enjoy an instant download. With 29 years of murder mystery party experience we are the best! How does a murder mystery party work? We can supply boxed or downloadable murder mystery games. Once you have your murder mystery game you can run the murder mystery kit yourself, or hire a professional murder mystery host. Your host will start with some fun and then announce a tragic murder! In small teams your guests will work together to identify the murderer. If you are looking for mystery party ideas you have found the best supplier of murder mystery games anywhere. Thank you for our fantastic Murder in a Box Mystery Party, we held our Staff Christmas Party last year and simply had the best time. It was a great way to build morale, everyone got involved and we all had a great night. I cannot wait to give another theme a go. Great easy to follow instructions that includes everyone at the party! Create a party where all the thinking is done for you, you can’t go wrong! Thank you so much! I can’t wait to throw this party. I have used the boxed versions three times before and our friend LOVE these nights!! So much fun!!! I just wanted to thank you for helping to make my 50th birthday party a very special and memorable occasion. The night went perfectly and Chris is a masterful host who interacts wonderfully and involves the whole company. Again, many thanks for helping with a magical night. Thank you for a very entertaining night full of laughs, everyone really enjoyed it and the role playing was hilarious! Many thanks! Thanks so much for hosting the night. We had a really great time. 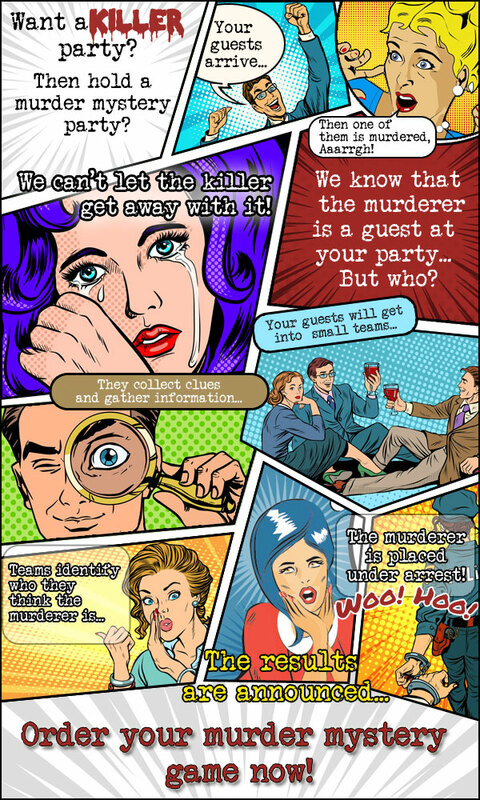 Organise a murder mystery party in 3 steps! We provide murder mystery party games, kits and nights and have professional hosts that know how to host a murder mystery party in Perth Western Australia, Adelaide South Australia, Melbourne Victoria, Sydney New South Wales, Hobart Tasmania, Canberra Australian Capital Territory, Brisbane Queensland and Darwin Northern Territory. Common misspellings that people use when searching for how to host a murder - mistery, muder, mistery, myster, mystrey, mystry.